How are your own experiences, did you also change your collecting focuses after a long time of being already an "advanced" and experienced collector? I collect undamaged minerals, mainly in miniature size, some on hand size (he space I have.). Tobi, I found that a radical change in my collecting focus was a most illuminating and liberating turning point in my collecting career. I realized I could not do justice to collecting the world and decided to focus exclusively on Mexico. This freed me to enjoy things from everywhere without having to own them, and focus my acquisitiveness on Mexico. It is hard to understate how rewarding that shift was for me. I encourage you to look up Dunn and Francis's 1990 Mineralogical Record article on Specialization in Mineral Collecting...they examine a wide range of collecting philosophies and among other things opine on what makes an interesting mineral collection interesting to more than its owner. We put so much energy into our collecting that it would be a shame if there was no reflection of more than "Tobi liked it" that survives our efforts. Collections like that get taken apart quickly. As we personally choose what to collect we are equally free to change our focus (perhaps adopting Lluis's philosophy of only buying "the best" if that is knowable/attainable...a separate philosophical rabbit-hole) as our knowledge, taste and experience evolves. I have watched many other collectors discover a similar shift in exactly the way you describe to find themselves with the joys of starting on a new trail that will lead who knows where. I hope that someday one of my "detour" sub-collections (wulfenites, pyrite pseudomorphs after pyrrhotite, and things from skarn/replacement deposits) will take on increased interest to me and I will come to Yogi Berra's famous "fork in the road" and take it. I began by collecting more broadly and now I specialize in calcite from the United States. Initially it began as an accident. I looked at my collection and pondered, "boy I have quite a few calcites." That branch just started growing on its own before I noticed. Once I recognized this branch, then I realized where my heart really was. Since then, I have been passionately collecting US calcite. One of my current projects is a group called "Calcite Collectors" on Facebook, which I use to gather and share knowledge of specimens and localities, as well as make connections and share photos. Another project of mine involves making sense of the plethora of specimens that have come out of the Viburnum Trend over the years. Most of the discoveries have never been reported, so I enjoy not only chasing down a good specimen, but chasing down the history of a particular find. In doing so, I've uncovered a few interesting facts. I have noticed a few side-branches and old branches that I may pursue in the future, some being Mexico, Chinese calcite, and also rough and cut pairs. I wonder how many of us can say our focus brought itself into focus over time rather than it developing from a deliberate search for a focus? And if that happened to you how long were you collecting before it happened? And what triggered the Ah Ha Moment for you? Or what turned you away from a certain focus? I have a LOT of Santa Eulalia and Mexican calcites, but have never considered myself a calcite collector despite that. For me it started with collecting San Diego County minerals some 50 years ago from T/N’s to Small Cabinets. I still added to the some 300 specimens in the collection when one comes around that fits with what I do not have. I moved on from there to World Wide T/N’s since it was all I could afford at the time and it was also what my mom was collecting. Between the two collections and adding on later in life I have built up a pretty good collection but am no longer adding to it. The real fun that I found was in trying to collect at least one mineral from each of the United States which I finally did a couple of years ago and still add on the that collection. Somewhere over time I found myself building up an Arizona systemic collection that now numbers over 200 specimens with a lot from locations that most people do not collect from. But then again Les has been a big help in that. Living in the middle of know where California I found out really does disconnect one from the mineral world and I really do enjoy being able to share what I have with this forum. I think what turns me away or prevents me from taking other roads is the momentum that is already behind the main focus and the cost of having two collections at once. I think that if I ever tire of the main focus, then one of those roads will inevitably open up. With that in mind, maybe I should hold on to some of those budding branches rather than sell them. So in my case there was a gradual evolving in focus. In my case the final focus turned out to be the most satisfying by far. And I discovered that as I focused more and more I could learn more specific information about my chosen passion. Not all of my specimens were display quality. I chose quite specifically to get varied morphology, colors, etc, and always was looking for interesting paragenesis pieces as well, even if they were often not aesthetic. Bottom line, every collector finds their own way and how that develops is part of the fun. I think collecting items is an affliction, or maybe even an addiction. Not being a psychologist, I'll try to stay away from trying to explain the compulsion. I am, however, educated as a geologist, and one of the things that has always motivated me as a mineral collector is to assemble suites of specimens that represent certain geological and mineralogical environments. One of my first obsessions was granitic pegmatites, which represent the end phase of magmatic differentiation and the transition to hydrothermal geological environments. Anyone familiar with these things is likely aware that the prime collectables include tourmaline, beryls, topaz, and other gem crystals. I was fortunate enough to be interested at a time when good quality specimens of these things didn't require significant financial resources, coupled with the active production of mines in places like Southern California. Things change and one must adapt. Mines close, supply dries up, and prices skyrocket! Welcome to the proverbial fork in the road. A couple years ago I found myself at a point where I could not afford to add many more significant specimens to that collection, so rather than agonize about the debt load required to continue I decided it was time to change direction. Having been involved in a mining project that worked a deposit in a classic Mississippi Valley-type low temperature hydrothermal deposit (perhaps close to the geological opposite of granitic pegmatites), I am now obsessed with minerals from these deposits. 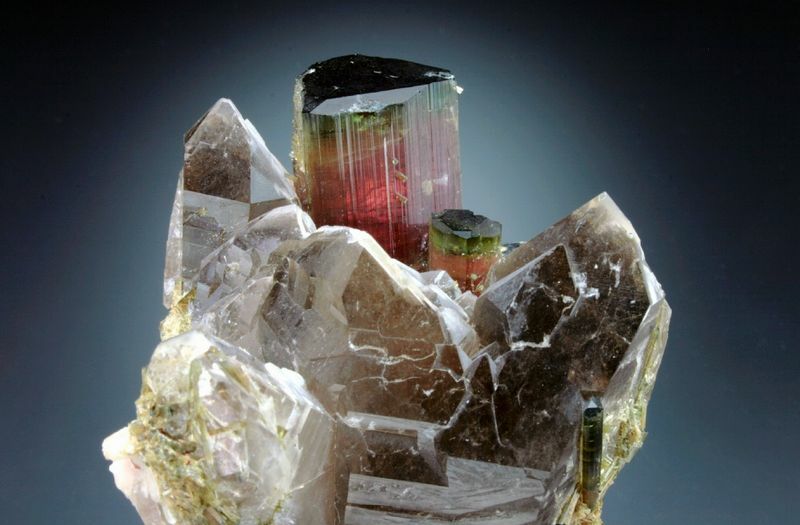 Prime among these it fluorite, which is quickly becoming the new tourmaline as far as mineral collectors are concerned. Perhaps there is another fork in the road approaching. Fortunately for the obsessive collector, there are many paths - guitars, art nouveau furniture and prints, souvenir beer glasses, airline tickets, and more. Forward in all directions! One of my first tourmalines, from the Himalaya Mine, San Diego County, California. Recovered in the late 1950s by Ralph Potter. Still here in the display cabinet. Wow does that name (Ralph Potter) bring back memories of the Himalaya Mine along with Josie Scripps, neither name do you here very often anymore. Spent a lot of time collecting on the dumps with Josie under the Pine Tree. When I was a youngster of about 10, I started collecting stamps and US coins. My dad's business partner was an experienced stamp collector and became my mentor. One thing that he taught me at that early age was that virtually no advanced or experienced stamp or coin collector collected "world wide" stuff. All their collections were, in one way or another, focused. This attitude was instilled in me at that early stage of my collecting. It has been part of my collecting to this very day. When I began collecting minerals in the early 1960s, most of my collection consisted of specimens that were field-collected in my home state of Massachusetts and a few adjacent states. I was fortunate in that there were many localities that were open to collectors at that time. My collection continued to grow through trips farther afield (Michigan, several locations in Maine, as well as Canada), and also through trading and the occasional purchase. During the time I was in college and my military years, collecting ceased entirely. By the time I resumed collecting, I found myself residing in Oklahoma - a state not known for a multitude of good mineral collecting locations. I began attending a few local mineral shows in the mid-1980s and gradually added a few worldwide specimens to my collection. This opened up a whole new frontier, and for some reason I found myself drawn to the polymetallic deposits of Maramures, Romania, Madan, Bulgaria, and Dal'negorsk, Russia. 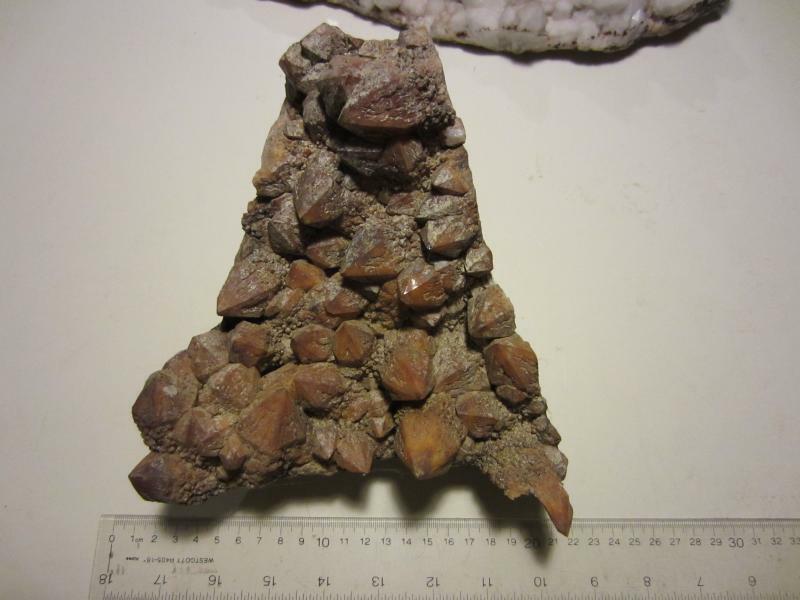 I actively pursued specimens from the mines there, and began assembling suites of specimens from those 3 locations. About 15% of my entire collection is from those 3 locations. 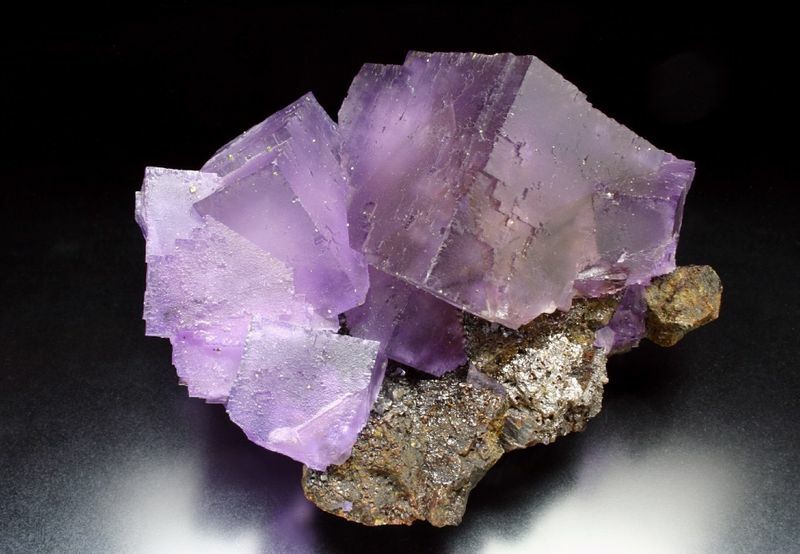 Early on, I also became interested in the southern Illinois fluorspar district and began adding to the small suite of minerals that I had assembled from those mines. Minerals from the southern Illinois fluorspar district currently comprise about 10% of my collection. While I still acquire minerals from worldwide locations that interest me (the mines at Huanggang, China for example), my interest in Romania, Bulgaria, Dal'negorsk and southern Illinois has not waned, and I am still actively building sub-collections from those four areas. A fifth sub-collection consists of my favorite mineral - galena. 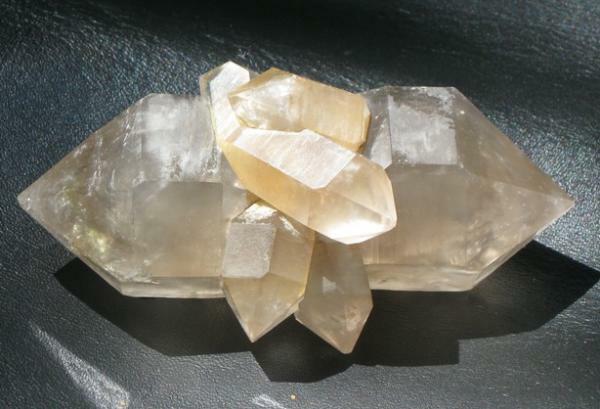 From the time that I acquired my first specimen consisting of several perfect cubes on chert from the Tri-State District, I have been enamored with galena, and about 5% of the minerals in the collection are galena specimens. So, over the years my collecting focus changed a bit, but it isn't so narrow as to exclude specimens from other locations, or to divest of pieces that don't fit into the 5 sub-collections. Or maybe "you can stab it with that steely knife, but you just can't kill the beast!" One of the earliest fluorites in the collection, acquired in 1985 for the astronomical sum of $25 USD. My collection started when I was about eight years old about 50-50 with self collected and donated by parents friends. I never stopped and knew I was addicted from the start. I don't know about others, but it is easier to maintain the best pieces when they have to be purchased or traded, but when you have worked all day or all week or for many weeks at some location every piece that passed the first sort seems too dear to do anything but keep once it gets home and in the collection. The self-collected ones bring back all the memories of the day collected - from the cuts through the snake you had to avoid, to the rain, to almost breaking my back with a pack full of rocks back to the car, to cleaning them at the campfire, to proudly looking at that beauty which had never before seen light now looking so beautiful in the light.